The title of the thesis work that Pavel Sterec graduated with from the Academy of Fine Arts When there are too many things going on outside that I would like to attend, I usually end up staying home suggests that heterogenic elements are incorporated into a laconic result. The strategy of the social happening that Sterec intentionally develops here concerns hobbyists and leaders of interest activities (specifically birdwatchers). The actual outcome of his work was swamping the hobbyists with a ton of information about their interest activities (lecture about birds, ringing, film about birds, etc. ), all taking place at the same time in different places, although any artistic activity was intentionally denied. The art work (the hobbyists’ dilemma about what to visit) could be viewed only ex post in the gallery environment by art viewers, rather than observers or participants of interest events. In his previous actions and projects Sterec revealed, virtually psychoanalytically, the face of natural environments influenced or sought-after by man. In addition to other things, there were caves or mines. An example of a similar descent to a metaphoric subconscious is the performance with a mining theme entitled Canary (Kanárek) – passing through a graphitic mine with a canary in a cage. In 2011 Pavel Sterec participated in the Jindřich Chalupecky Award with the project Two Small Points of Intersection on a Large Vertical (Dva malé průsečíky na velké vertikále). Sterec’s installation was virtually a paraphrase of a museum with geological exhibits. However, parts of it were also performances. The first one entitled Live Library (Živá knihovna) took place in the area of Koněpruske Caves and the second one entitled Speed Dating was in the astronomic observatory on the Petřín Hill. In the first one, living representatives of scientific fields such as philosophy, mathematics, physics or astronomy met with invited as well as random visitors of the caves and they held free discussions in the interior of the underground dome. The discussions that revolved around the scientific fields of the participating scientists but also around their personal life, took place on a “face to face” level – non-hierarchical, therefore horizontal basis. Once again, it was a sort of social happening, as well as a return to the cave environment as a physical metaphor of the subconscious. In the action Speed Dating single clients of a dating agency were meeting in the environment of the observatory – everyone with everyone in a non-hierarchical and horizontal way similarly to the previous action. These two “horizontals” were symbolically intersected by a vertical in the space of the gallery where Pavel Sterec placed a glass display case in which fragments of dripstones and meteorites were symbolically drawing near one another. Two points “between heaven and earth”. Starec’s intellectual ambiguity and epistemic background lead him to doing work that is like pre-contemplated and almost scientific, nevertheless kaleidoscopic structure, which is intentionally exposed to a collision with randomness and irrationality. 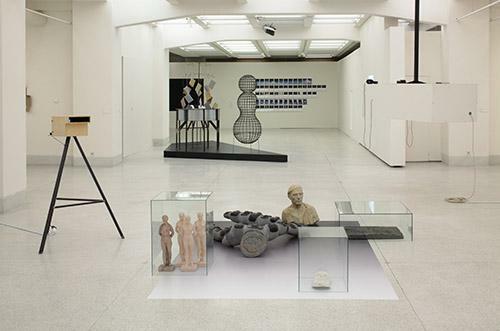 For example, the exhibition entitled Motionless Exchange (Nehybná směna) in the Atrium of the Moravian Gallery in Brno was made up of several different artefacts in various media, nevertheless all depicted the same phenomenon. The central piece of work was a replica of a stone coin the original model of which comes from one of the Micronesia Islands. It serves there as a stationary means of payment where the coin does not circulate (because it is too heavy) but only its owners change. The stone and its weight also have the function of a symbol of a capital invested and gained without it having to change its location or transform in any way. Sterec maps the migrating image of this stone coin in his western representations and he brings attention to how it has become the “projection plane” of contrary political and economic ideologies. 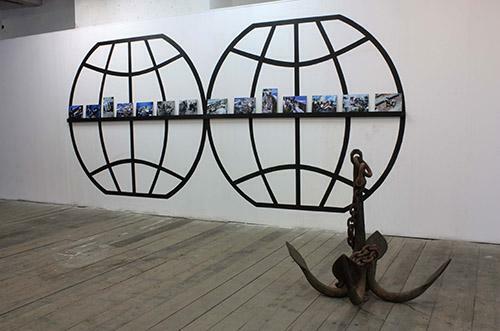 Some of the subjects that the artist continuously follows include value, fetishism and ownership. He often, and over again, opens the question of an artist’s dependence on his/her own craft skills, forms of authorship, cooperation and appropriation. His intellectual instruments of knowledge are just as much of a subject for their new visual perception, critique or analysis, as they are an artistic medium.